Yeo Vale Rotary Club held its biennial East Coker Charity Night on Friday 18th May at the village hall. A full house sat down to an excellent two course meal provided by Helen Furness, who has been helping us with this event for many years. The main speakers were Andy Strachan, Chief Test Pilot for Leonardo, & Brigadier Richard Folkes (ret’d), ex Army Air Corps, also now with Leonardo. They had been asked, at very short notice, to help in the making of the James Bond film, Skyfall, along with their Big Green Flying Machine with a tail ramp…the new Westland AW 101. What proved to be a very exacting task, was great fun as their slides and film clips showed. Both were very impressed with the film industries’ attention to every detail, artistic efforts and sheer persistence to get everything just right. The speakers then moved on to tell us about how they delivered “HM The Queen”, by parachute, into the arena at The London Olympics in 2012. Needless to say, the overall planning for this was exceptionally detailed. The plethora of approvals required, the timings of every move to the second and the hope that the weather would be kind, which it was. Providing the AW 101 in non-military paint, in a rush, was just one of many minor crises to be overcome. Andy & Richard showed video clips of Her Majesty & James Bond, along with a couple of boisterous corgis, when they were at the Palace during the filming. Both Andy and Richard enjoyed the whole episode immensely but were probably much relieved at the conclusion of such a successfully completed task. A very memorable, amusing and interesting presentation which those attending certainly enjoyed. 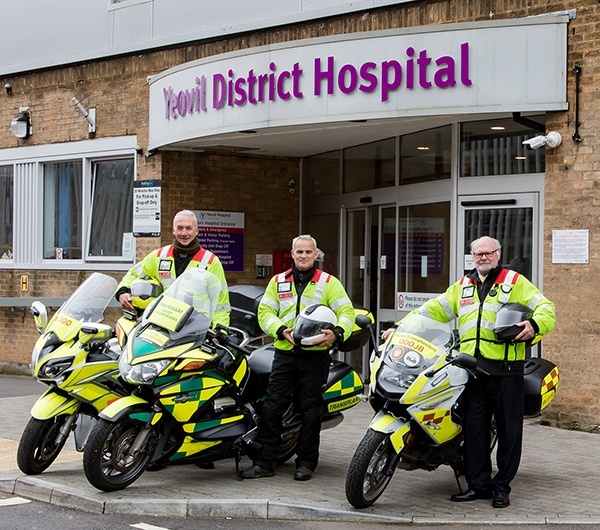 The main beneficiary of the evening was Yeovil Freewheelers (The Blood Biker Boys), a number of whom attended the evening and showed off one of their special bikes. The event raised almost £1,500 for this very necessary charity, all members of which are volunteers. Andy & Richard were kind enough to help by offering for sale a special Westland Aircraft Book, from which all proceeds will go to Freewheelers.